This extraordinary history of the Bruderhof shows how its commitment to religion, family, and community has enabled it to maintain its way of life since its inception over ninety years ago. 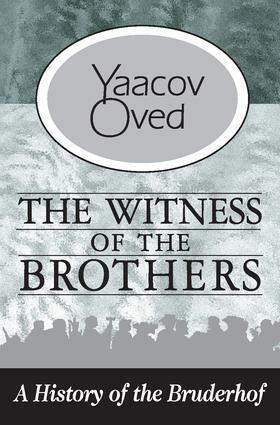 Although Yaacov Oved identifies social tensions in the movement, he still considers it to be a shining example of communal stability.After the horrors of World War I, German adolescents sought new directions in the form of youth movements. Young people from bourgeois families rejected materialism, celebrated nature, and longed for a simpler life. Eberhard and Emmy Arnold, a couple from an affluent background who identified fully with radical pacifist youth circles, fused the German Christian socialist youth into a new movement. They settled a commune in Sannerz known as "The First Bruderhof," whose members shaped their lives according to their faith.The Bruderhof supported itself by publishing, printing, and providing reliable child care services. In 1937, responding to Nazi harassment, and to escape conscription, they fled to Liechtenstein and England where they provided shelter for many Jewish refugees. World War II forced them to emigrate further afield. They went to Paraguay and, eventually, to the United States. Sociologists, theologians, anthropologists, and psychologists alike will find The Witness of the Brothers to be a valuable resource.